Gravesites of Elza and Elwood Morris, buried near parents, grandparents, and siblings. The church in the background is the location where the family worshipped. Elza and Elwood Morris, twin brothers, were born in 1840 to John Morris, Sr. and Delilah (Biggins) Morris in Watertown, Washington County, Ohio. The twins had siblings: William, John, Nancy, Tamar, Harvey, and Minerva. 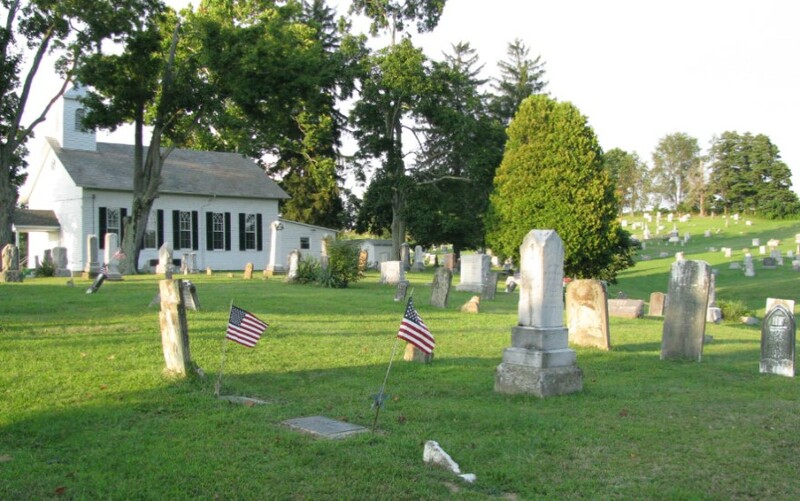 The family resided in Watertown, and many of them are buried there at Watertown Cemetery. Near the start of the Civil War, Elza and Elwood, along with older brother John joined the Union efforts by volunteering for the 77th Ohio Volunteer Infantry. Their older brother William, younger brother Harvey, and brother-in-law Henry Smith (Tamar’s husband) volunteered as 100 day men in the 148th Ohio Volunteer Infantry. Elza and Elwood’s service was primarily the Battle of Shiloh. Company B of the 77th OVI was at the vanguard of the beginning of the battle. An interesting story on how this unfolded at Shiloh is presented below. Elza and Elwood’s service in the war was cut short by illnesses contracted during service, and then succumbing to these illnesses one month apart from each other in the Fall of 1862. The sad series of events is written below. Note, the elder brother mentioned in the story is John. Both stories are left as written in The Marietta Register. From Advance Sheets of Military History of Washington County, Part of History of Washington County, H. Z. Williams & Brothers. This Sketch was Written by Col. William B. Mason, 77th O.V.I. On Friday evening, April 4, 1862, Co. B, Capt. William B. Mason, was ordered on picket duty in front of Shiloh Church, toward the See House, on road to Corinth. That night at 11 o'clock, and again at 2 o'clock, the guard plainly heard the beating of drums in the front, as if but a short distance off, and some of the guard wondered if our troops were moving on toward Corinth without their knowledge, but daylight coming on they discovered that the birds, rabbits, and squirrels were fleeing out of the woods toward them, and passing the picket guard line, thus showing that a large body of men was in their immediate front, which was fully verified on Saturday, the 5th. Capt. Mason at once established a few new vidette posts at favorable points of observation and at 11 o'clock P.M. at the extreme outposts, grave covered calvery-men were discovered advancing, endeavoring to conceal themselves behind a ridge about seventy-five yards distant. Having arrived at a small opening, three of them discharged their carbines at the vidette, one ball striking a small sapling about six inches from his head. He thus received the first shots of the rebel army that was preparing to annihilate the Union army around Pittsburgh Landing. At about 2 o'clock that same day (Saturday, April 5), large bodies of cavalry were discovered approaching the Union lines, and filing off toward our right, keeping under cover as much as possible. Soon after column after column of Infantry arrived at the same point, filing to the right and left, taking up their positions as in line of battle; also several pieces of artillery went into position on the ridge just at the edge of the open field. Capt. Mason, believing this display of the enemy in full force was alarming and should be reported, detailed Sergeant. C. J. Eagler to go in person to the brigade headquarters, which was also the headquarters of the 77th Ohio Volunteer Infantry, and report the presence of the enemy just as it was, and return to the picket line. The Sergeant made his report of the simple fact, and returned and reported to his Captain on the picket line. Hildebrand, brigade commander, says he went to Gen. Sherman's headquarters and reported the report sent by Capt. Mason word for word, and that Sherman pooh-poohed at the idea and ordered the messenger, C. J. Eagler, to be placed under arrest. Col. Hildebrand executed the order by sending Capt. Stevens out with a part of his company to arrest said Eagler. Capt. Stevens reported at the picket line to Capt. Mason his orders to arrest Eagler for bringing false and scary new from the front. Mason replied to Stevens: "You have not men enough to! take Eagler; he has simply obeyed my orders, which he swore to do when he enlisted. Go back to headquarters and have the order changed for my arrest, for I am responsible and have sent in the facts as all on duty here know." -- Capt. Stevens returned, reporting the facts as related. Soon after Col. Hildebrand and part of his staff came out to the picket line. The Colonel asked Capt. Mason what this all meant. Capt. Mason replied: "General, it means that the enemy is directly in our front. Do you wish to see them, if so, ride to the edge of that little opening to the right, a few rods to the front." Hildebrand and staff did as requested, accompanied by Mason, who pointed to the enemy, who Hildebrand could see without the aid of a field glass. After looking in the direction indicated, he exclaimed, "My God! Sherman has been deceived, for he told me to-day that there was no enemy this side of Corinth, except some reconnoitering parties." Hildebrand returned to camp, and took the precaution of doubling his picket guard by detailing two companies, C and G, to relieve Company B at dark. Saturday night Hildebrand also reported to Gen. Sherman that he had been to the front and it was true the enemy was in our immediate front with every appearance of a determination to attack. Hildebrand frequently said afterward that Sherman treated him in a rough and contemptuous manner, saying that his scouts had just returned from near Corinth without alarming reports, Hildebrand returned to his headquarters, still fully believing that the Union army was on the eve of an attack, and began to write letters accordingly. At about 11:30 o'clock that night (Saturday, April 5) the company commanders of the 77the Regiment not on duty, received from their headquarters an order like this: "Form your companies on the color line and move to the old drill ground and drill one hour before breakfast." Capt. Mason receiving this order with the rest, and knowing that Hildebrand knew the facts above related, went to his headquarters, and after talking a few minutes, asked, casually, who originated the order for regimental drill in the morning. Hildebrand, picking up a paper from his desk, said: "This is the order from Gen. Sherman, but we know it will be different drill on the morrow than any of us have ever seen." This order has always been a mystery to the 77th Regiment. On Sunday morning at daylight the regiment was on the way to the drill ground. Having gone a few hundred yards under command of Major B. D. Fearing, we were overtaken by an orderly and ordered back to camp to eat breakfast and fall back immediately. Breakfast was hot and ready. Some were drinking half warmed coffee, when the orders came as follows: "The 77th will fall into line quick: Company B will move to the front, deploy as skirmishers, move forward to the See House." The company promptly formed and moved forward on the road, and crossed the bridge about fifty yards in front of the regimental color line. Capt. Mason gave the orders to deploy to the right of the road and before the company was deployed they were directly under the fire of the enemy, and several were knocked down among them one of the noblest of the company, George Booth, of Marietta. Thus commenced the battle of Shiloh. It is believed that no man could see all the incidents of any battle, but from the standpoint of that skirmish line, and wherever they were during that terrible day, all stood ready to obey with alacrity, any orders issued to them. The skirmishers having been pressed back upon the regiment, under command of Maj. Fearing, who took command of any and all troops, of whatever command, held the ridge to the right of the church, under the eye of Sherman, until nearly surrounded, when they fell back by the personal order of Gen. Sherman to Maj. Fearing. Line after line was formed and held until ordered to change. Thus was spent the whole of that bright, beautiful Sabbath day, amid carnage and death.